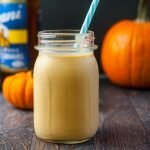 This low carb salted caramel pumpkin smoothie is just the thing to get your going in the morning. With only 5.4g net carbs per serving, it could be a dessert too! Add everything to a high speed blender and process until creamy.